Waiouru: I’m a lumberjack and I’m OK? Jan believe the title comes from an episode of Monty Python. And how did it arise? Well I wore my fur hat today and she took a snap. Forget this is a face only a mother could love……….. focus on the hat! Now this hat has a long history. As a pre-teen I became interested in hunting and trapping. I built my own trap which consisted of a small chicken-wire clad timber frame box with a vertical sliding front door. The door was held open by a trigger activated by a false floor 2/3 the way into the cage. My quarry was the NZ opossum. Actually they were Australian opossums that had been introduced into NZ by English migrants back in 1837 in an effort to establish a fur trade. With a far nicer climate and no natural enemies their population exploded and they started to destroy the natural habitat. Eventually they were officially declared vermin. I needed something to attract my prey into my trap. Way back then the cheapest sweets to buy were aniseed balls at 5 for one penny. Possums are attracted to the smell of aniseed. Half a ball would catch one possum. If I was lucky; 10 possums for a penny! How do you get one very angry.scared possum with long sharp claws out of your cage? My technique was to fit an old hessian potato sack over the end and raise the cage door before shaking it out into the sack. Once in the sack I could have drowned it or beaten it to death (boys do this stuff!). However because I’m a SNAG (sensitive new age guy) I would place the hessian sack in a canvas bag and fit the open end over a running car exhaust pipe. My possums would drift quietly off to permanent sleep. Skinning them wasn’t an issue once dad had shown me how it was done. I’d then nail the pelt to a sheet of plywood, scrape it clean and salt it before allowing it to dry and cure in the sun. My pelts would then be sold. Good pocket money and I was doing the environment a service. Not that I realised it at the time. Oh, yes I have eaten possum. It’s not something I would recommend…. unless hungry! Wind the clock forward 15 years. We were in a location where I needed a warm hat. A fur lined hat was very appealing. This resulted in me tanning a number of ‘green’ possum pelts to make my own hat. 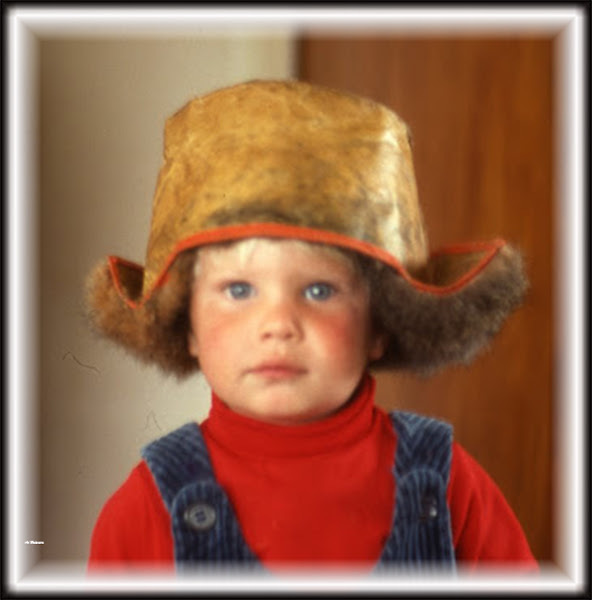 It wasn’t particularly easy because the hat became quite an attraction in our house and would regularly disappear. It’s almost half finished in the above photo (looks better on him). The process took quite some time because the hat kept going “missing”. The model in the above photo is now 38 so you will have an idea of the age of the hat. Well it did get finished (eventually) but our location had changed and so had the requirement. After all the effort to make the hat it was placed into storage. As part of our pre-overseas planning we went through all our possession to sort out what would be sold or disposed of and those items that would go into storage. During this process I came upon the hat and thought “That might be useful on the canals!” And that readers is how the NZ possum fur hat finally ended up on my head. 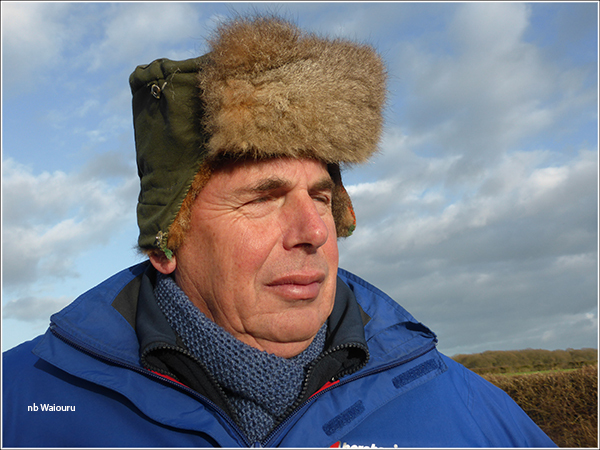 Love the hat, Tom, and I bet it's a boon in the colder climes of the UK canals! I am wondering though why it has such a large furry visor? Did your younger eyes need to be kept warm when you were snoozing? You have a great memory. I didn't remember the previous post on the same subject. Must be age! It was my first and only attempt at hat making. The size of the visor was a guess and I erred in my judgement. Mum lived on a farm near Hunterville in her early teens and my parents were married in the Hunterville church. Small world! The Vennells are our B&B host friends who were on Richmond Farm at Rewa, off Vinegar Hill on the SH (54?) to Feilding. Lovely, lovely people. It is a small world, isn't it, and esp for NZers for whom the standard is 2 degrees of separation rather than the more usual 6.